Also, I'm going to start using the word snarkatariat as frequently as possible. When I successfully applied for the AMS Howard Mayer Brown Fellowship during graduate studies at Duke, I expressed the hope that my scholarship, at that time on Black sacred music, would serve as both a mirror of self-relevance and a door of academic opportunity for underserved youth. I appreciate the invitation to share with readers of this blog the vision and work which have resulted from that goal. After completing the Ph.D. in musicology at Duke and a Mellon postdoc at Brandeis, I embraced nonprofit work at the intersection of applied ethnomusicology, music education and social jutice. The term “underserved” is a catchall for those who live on the least resourced ends of society’s gaps and are frequently classified in terms of race, among other group identifiers. The idea of forging pathways to academic and scholarly excellence for underserved youth by focusing on education in music of the African Diaspora might seem circuitous since K-12 education and the academy remain Eurocentric. I believe that expanding opportunities for all youth to study music of the African Diaspora in contextualized ways can accelerate youth achievement and amplify the intellectual robustness of the academy’s musical spaces. The work I do is very much grounded in my experience of growing up among the most impoverished, yet being enriched in powerful ways that dovetailed with and prepared me for academe. This is the paradox of community cultural wealth, a concept so beautifully articulated by Yosso. Across the river from St. Louis, spending money was scarce when I was a Jr High school student. So when my piano teacher Ms. Margie chose me to join a small group of her students who filled the need for short-term musicians at area churches, I willingly took on the extra responsibilities. It meant biking or walking the two and a half miles to her house for extra lessons on Saturdays before sunup, taking taxis alone to unfamiliar places for late evening rehearsals and services, rising earlier than usual on Sundays, returning to church on Sunday evenings for BTU (Baptist Training Union), and then having my parents use all my earnings for household expenses for the ten of seventeen offspring who still lived at home. Over the years the sense of duty faded into the background, but it wasn’t until Ms. Margie passed away during my graduate studies that I began to understand the rights and privileges, the knowledge and skill, the networks and life skills – the wealth – these opportunities had conferred. Amazing musical talent flourished at group lessons, but I never quite mastered improvisatory gospel style. Ms. Margie admonished us all to purchase sheet music for our songs – songs she was teaching through the oral tradition. After her passing, I understood the broader ramifications of that request when I catalogued the hundreds of “ballads” by Professor Thomas A. Dorsey and others gospel composers she had collected during her travels accompanying them and in her time as organist for the National Baptist Convention. I also completed a historical ethnography on gospel music in St. Louis, which revealed to me the wealth I and others had acquired as apprentices in a vast unheralded music education system that spawned the gospel music industry. The school-to-prison pipeline means that children with backgrounds like mine are thrown away every day in this country “for where there is no faith in your future success, there is no real effort to prepare you for it.” Parents in my community could not be sure that educators in highly segregated school systems, then as now, would have the faith to put forward the effort to prepare their children for future success. Thank God for a community of musicians who invested what they had – cultural assets – in youth like me! My sense is that there is consensus about several current realities. Music of the African Diaspora, including African American music, is intricately interwoven in the fabric of American lives and culture. The academy narrowly embraces scholarship, composition, theory, performance, instruction and teaching in Afrocentric traditions. The available educative riches of these traditions are primarily invested in white middle-class children at all levels of education. These realities suggest to me that a musical politics of suppression, denial and ignorance makes a silent but salient contribution to throw-away attitudes about Black youth. My life experiences, research, scholarship, observations and teaching have convinced me that community music education programs, well-conceived and well-executed, can dialog effectively with the academy, K-12 education and society to play an important role in reversing throw-away attitudes; and in strategic placement of mirrors and doorways (see opening paragraph). 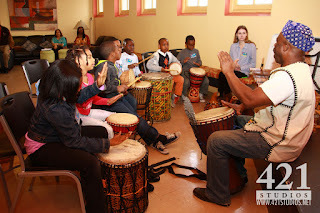 Because so many co-opted African-based expressive practices have become invisible in American culture, it is important to help all youth gain a better understanding of this part of their cultural heritage. That may sound simple, but it’s quite revolutionary. If the study of African American music, in the context and cultural integrity of the African Diaspora, were solidly situated within all communities, even segregated ones (as most of our neighborhoods still are), the stage would be set for a new crop of young leaders who embrace a multi-racial identity. While the current Eurocentric music academy and education systems erase significant parts of who we are as Americans, and of who we are as African(-influenced) Americans, community music initiatives could help people see themselves in each other, and be able to affirm African ways of being in themselves. The most well-funded youth music programs in the country, for youth of any ethnicity or cultural background, are Eurocentric. El Sistema programs in the U.S., operating under the banner of social change, work to ensure future Western classical music audiences and to preserve the musical canon of dead white men in the bodies and musical imaginations of black and brown children. That’s social continuity, not social change! And as long as society and academe honor no other tradition in education systems, parents will feel compelled to esteem this literacy for the sake of their children’s future, but to the detriment of their children, since we now know that when children’s cultural tools are suppressed or denied, students are disempowered educationally. In 2005, I founded BUMP, Inc. (formerly Boston Urban Music Project), a nonprofit music education organization, to empower youth much the same way Ms. Margie empowered me and my peers. Our goal is to help urban youth gain musical proficiency, cultural literacy and personal resilience through music of the African Diaspora. This work has evolved over the years in step with community voices and research in arts education, youth development, critical race theory, social justice and social entrepreneurship. BUMP seeks to impart a toolbox of cultural knowledge and skill to propel youth toward greater success in school and life and we carry out this mission in three ways. First, we create unique and robust multimedia curricular materials for use in our programs and as the engine behind the social enterprise. We are working to bring two products to market: Griot on the Go™, a line of musical activity kits promoting family involvement; and BaobaoTree™, a line of curricular plans and materials for educators. Second, we provide in-school and after-school programs for children and youth – BUMP In™, BUMP Out™ and Pre-BUMP™. Finally, we partner with community members and institutions in a variety of ways to strengthen the networks of affirmation for youth and their cultural assets. Nine African themes articulated by Lee permeate the tools, perspectives and capabilities that we apply in teaching and learning, and they define a global village that celebrates African ways of knowing and being. We call them SCRRM HOPE™, an acronym of the nine values: Spirituality, Community, Realness, Resilience, Musicality & rhythm, Humanism, Orality, Personal style, Emotional vitality. The history of musical people nurtures a spirit of aspiration, excellence and success. Story-telling/song traditions promote communication, vocabulary and cross-cultural awareness. Listening and memorization in the oral tradition foster attention to detail. Interaction with expert educators cultivates healthy connections to community and broadens emotional, educational and occupational consciousness. Broad geographic variety facilitates global awareness and a sense of world citizenship. Having opportunities to identify the inner resources, social competencies and cultural strategies of musical people builds resilience and skill in navigating social institutions. Seeing a showcase of cultural wealth fosters positive racial identity and positive racial identification. Projects and activities advance the 21st century skills of creativity, problem-solving, collaboration and critical thinking. Projecting into the future, I envision partnerships between university music education departments, local public school districts and community music education programs like BUMP, especially in urban centers. Such a consortium would recruit highly qualified music education students to be trained and placed in practica, teaching programs like BaobaoTree with inner-city youth in public schools. An online network of current and alumni instructors would provide mutual support and contribute to ongoing curricular development over the course of their careers. BUMP, Inc. now does business as BUMP: The Triangle in NC and in the future (we hope) as BUMP: Your Metropolitan Area. If you would like to connect your community, school or university with BUMP in some way or just want to explore this vision further, I welcome contact at info@bumpthetriangle.org. You can take a look at our work with youth and NC Triangle communities at our website. Dr. Georgiary Bledsoe is a musicologist, social entrepreneur, and music educator who earned the B.A. and M.A. in music at Stanford University and the Ph.D. in musicology at Duke, where she was the Mary Lou Williams Instructor of Music. The American Musicological Society awarded her the Howard Mayer Brown Award for her work on the ethnographic history of gospel music in St. Louis. She was awarded a Mellon Postdoctoral Fellowship at Brandeis University with a joint appointment in Music, African & African American Studies, and American Studies. She also taught African American music and American music history at Tufts University. Dr. Bledsoe is the founder and Executive Director of BUMP, a Visiting Scholar at Duke University and a private piano teacher. Jennifer Fleeger has written a post over at OUPBlog about how the forthcoming film about Florence Foster Jenkins starring Meryl Streep asks us to consider the unique confluence of age, passion, (lack of) ability, and femininity that Jenkins represents. Check it out! “Marie Antoinette in a Chemise Dress” (1783), Hessische Hausstiftung, Kronberg. Despite its controversial reception, such faux-rustic attire represented the height of contemporary courtly fashion and paralleled significant changes in cultural taste. 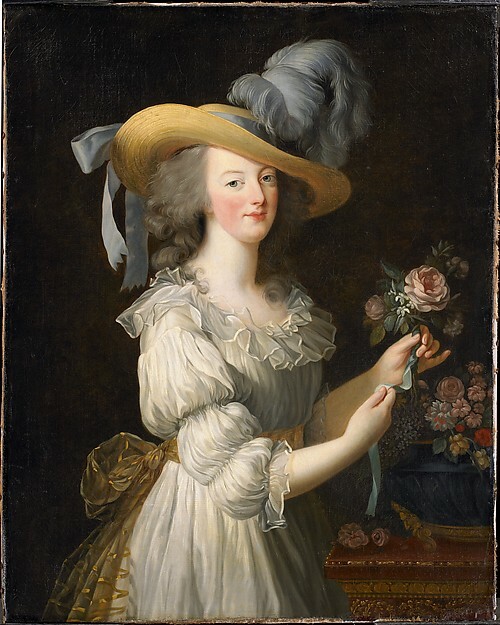 The painting of “Marie Antoinette in a Chemise Dress” corresponded precisely with the construction of the queen’s “hamlet” at the Petit Trianon, a pseudo-Norman village replete with a mill, a pleasure dairy, and a functioning farm. The iconic image also resonated with broader trends toward paysannerie in the literature, theater, and music of the late eighteenth century. The reign of Marie Antoinette was marked by substantial developments in the music performed at Versailles—a disruption in the conventional ideals of royal display as provocative as the more widely understood shifts in the realms of fashion and iconography. During the 1770s and 1780s the lavish tragédies lyriques of Lully and Rameau, which had for decades served as potent symbols of Bourbon power and prestige, were rapidly phased out of the courtly repertory. These were replaced by streamlined works from a new generation of composers supported by the queen: reform tragedies of Gluck (known for their ethos of “noble simplicity”); imported Italian comedies of Piccinni, Anfossi, and Paisiello; and, especially, light dialogue operas (opéras-comiques) that idealized the charms of country life. These interrelated trends in music and theater are aptly captured in the oeuvre of Vigée Le Brun presented at the Met. In the portrait of the baronne de Crussol Florensac (1785), the sitter grasps a score of Gluck’s Echo et Narcisse, a pastoral opera that premiered in Paris in 1779. The exhibition also features a striking painting of Paisiello, whose comic works headlined an Italian season at Versailles (a noted departure from the expected French-language fare) in the summer of 1778. 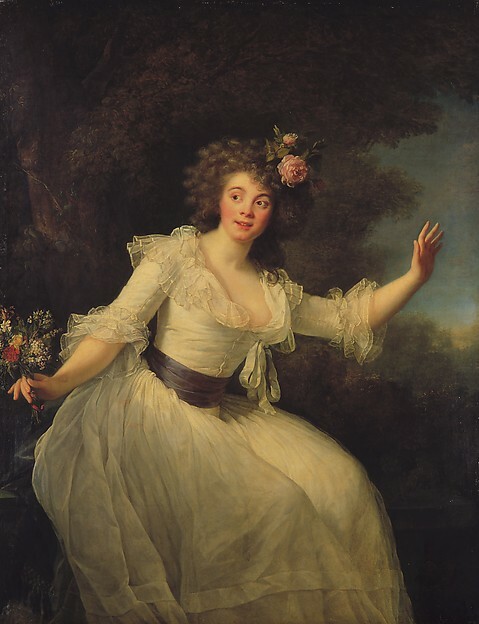 Perhaps most remarkable is “Madame Dugazon in the Role of Nina” (1787), which depicts a leading actress of opéra-comique in one of her most famous roles. Nina was composed by Nicholas-Marie Dalayrac, a musician in the employ of Marie Antoinette’s brother-in-law, the comte d’Artois. With its contemporary setting, popularly-infused lyric idiom, and sentimental plot (centering on a lovesick heroine driven to madness and sequestered on her country estate), the opera represented a stark contrast to the serious and grandly allegorical theatrical aesthetic long associated with the Bourbon monarchs. “Madame Dugazon in the Role of Nina” (1787), Private collection. Vigée Le Brun was an avid musician, as were many of her principal patrons and painted subjects. (Marie Antoinette, for her part, took lessons in keyboard, singing, and harp, and hosted informal concerts for her associates several times each week.) It is hardly surprising, then, that we find ample evidence of amateur music-making among the items included in the Met’s exhibition. A glance at the score held by the baronne de Crussol reveals that her copy of Gluck’s opera is not the original but rather an arrangement for voice and keyboard, an edition prepared specifically for domestic consumption. And several of Vigée Le Brun’s noble sitters were well-regarded amateur actors, known for performing operas in private theatrical companies (or théâtres de société). The comte de Vaudreuil, painted by Vigée Le Brun in 1784, was among the most sought-after aristocratic actors in Paris, and often appeared alongside the queen in the productions of her famed troupe des seigneurs. 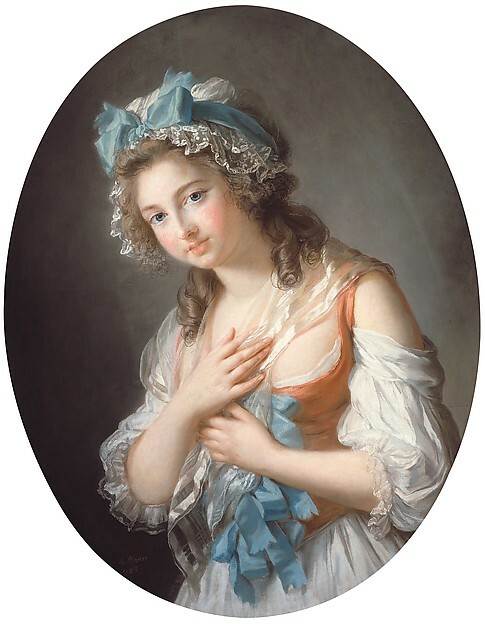 Another member of the queen’s inner circle and society troupe, the duchesse de Guiche, was captured by Vigée Le Brun (pastel, 1784) in her theatrical attire—dressed as a milkmaid. The similarities between this costume and the gown worn by the queen in “Marie Antoinette in a Chemise Dress” attest to the fluid boundaries between the “real life” fashions of the Bourbon court and the fashions of the lyric stage. “Duchesse de Guiche” (1784), Private collection. Such an aria exemplifies the blatant paradoxes inherent in both musical and artistic paysannerie of pre-revolutionary France. The radical simplicity of the romance, along with its rustic topos, were fashionable markers of operatic modernity. They also signaled (and confoundingly so, for critics of the Bourbon regime), a vehement rejection of the court culture from which they directly emanated. Julia Doe is Assistant Professor of Music at Columbia University. Her current book project explores the influence of Bourbon patronage on the development of opéra-comique in the final decades of the old regime. For further information on the painter and the exhibition, see the catalogue: Joseph Baillio, Katharine Baetjer, and Paul Lang, Vigée Le Brun (New Haven and London: Yale University Press, 2016). Caroline Weber, Queen of Fashion: What Marie Antoinette Wore to the Revolution (New York: Henry Holt and Company, 2006), 161. We here at Musicology Now are proud to salute Caroline Potter, Eric Saylor, and Daniel Melamed for their submissions to the 2016 Grove Music Spoof Contest. If you haven't already learned about the musical cheesegrater, Delray Odabee Raymond, or the Sphinculus, your musicological education is incomplete.